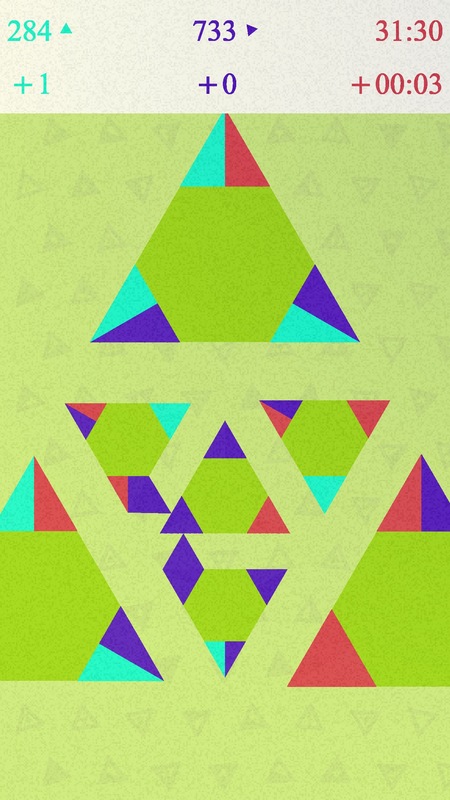 Yankai’s Triangle ($2.99) is weird. It seems to have a never-ending number of stages. Sometimes it looks at you. The colors are subdued one level, then shockingly bright the next. The scoring system is hard to make sense of. Everything is a little grainy. The eyes are watching. You might run into an absurdly difficult level followed by an astonishingly simple one immediately after. Before each level there are some symbols that mean something, but it’s hard to say what unless you really watch carefully. Sometimes there are teeth. The game also introduces each and every level with a title card saying the level number followed with “by Kenny Sun". 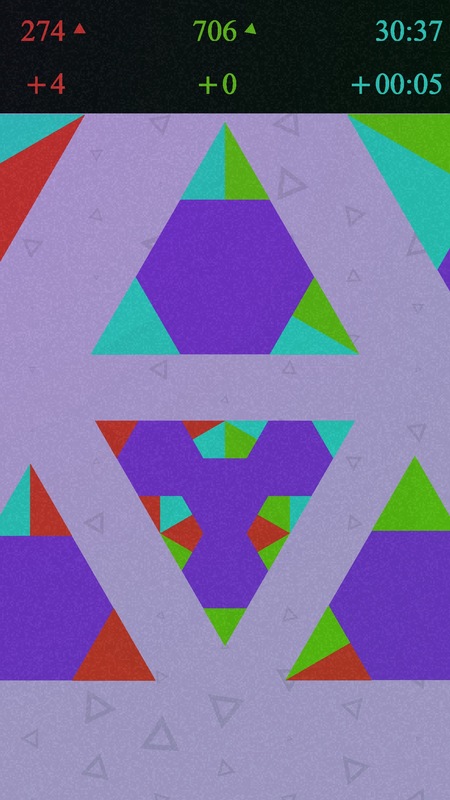 Perhaps the weirdest thing of all is that you’re not doing much more than spinning triangles around, trying to match colors to make bigger triangles, and yet it’s nearly impossible to put down. Your goal in each stage of Yankai’s Triangle is to spin the various triangle pieces around until they lock together into one big triangle. 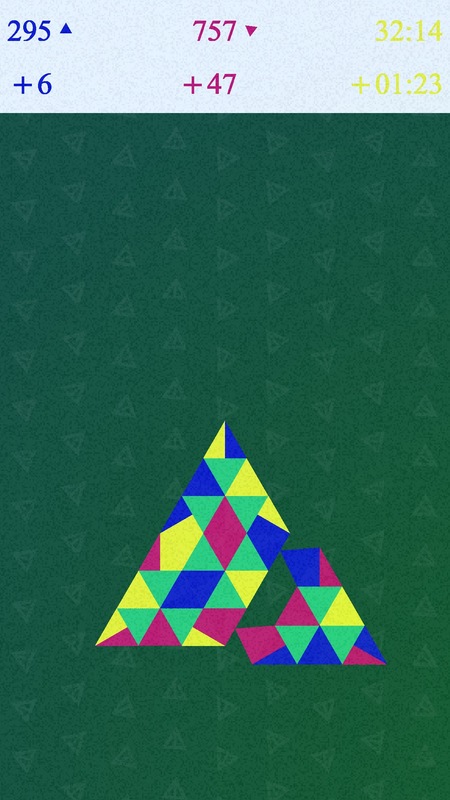 Each triangle has different colors along its outer angles. To lock two pieces together, those colors must match. Since you’ll need to match all but the outer set with multiple triangles, you need to make sure that the side you’re using isn’t meant to be used by another piece. It starts off simple at first, particularly if you have any experience with Triominoes, but as you play through things get a lot more complicated. Usually, a single tap makes the piece rotate once in a clockwise direction, but in later levels, you can’t even count on those points. The game starts off quite gently for the first several dozen levels. It’s easy early on, but the colors and perfect sound effects for spinning and locking pieces are liable to put you into a zen-like state. Once the game starts introducing certain twists, stages can get quite puzzling to solve. Yankai’s Triangle isn’t one for explanations, either. New mechanics are introduced and you’re meant to figure out how to deal with them on your own. Impressively, it’s usually not that tough to do that, but there’s a wide gap between learning about a gimmick and being able to work your way through stages that feature it. To be honest, I’m not even sure if I’ve seen every gimmick in the game, because I’m not sure where it ends or even if it ends. I know that even after a couple hundred levels, there are still new things being introduced, so take that as your measure. Basically, this is a game that takes time to show its cards, but it’s well worth sticking with it. There’s something a bit brilliant going on here, like the designer is playing with you just about as much as you’re playing with the game. Going into details of the more advanced mechanics would be spoiling the fun, but if you give the game time to do its thing, I don’t think you’ll be disappointed. 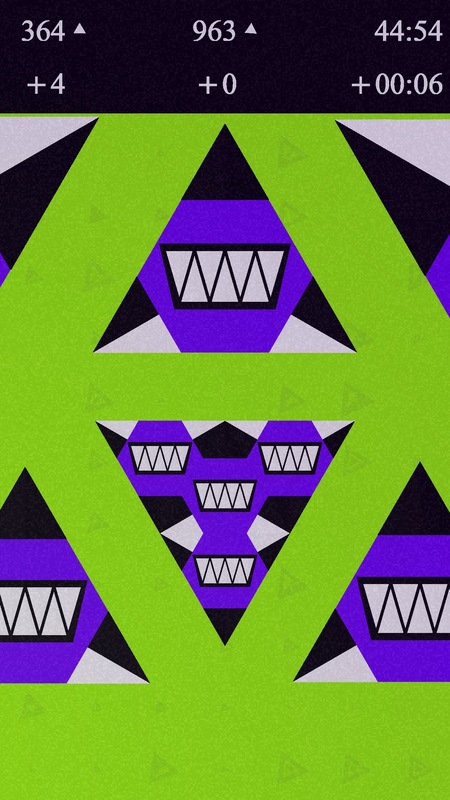 Even outside of the specific ways the design will mess with your head, there’s a core appeal to the simple act of fussing around with those triangles. It’s almost relaxing, similar to the way folding a whole bunch of laundry can help clear your mind. Is that appealing? I don’t know, but it’s the analogy I’m running with. An important way Yankai’s Triangle feeds that feeling is by not punishing you severely for making mistakes. You might have to zoom in or out a few layers to reset some pieces, but you’re not racing a clock or having any pressure applied to you. You made a mistake, just go back and flip some pieces around until things look better for you. I like tense puzzle games, of course, but there’s something to be said for more deliberately-paced games like this one. It’s kind of good that the clock is largely irrelevant, as you’re going to want to soak in the aesthetics as much as possible. This game does some gorgeous things with relatively simple visuals, and the sound effects and background noises do their part to contribute to the hypnotic atmosphere. There are a couple of negative points that I want to mention, however. First is that the game lacks iCloud support, so if you like to play across multiple devices, you’re just going to have to choose one and hammer away at it. There are so many levels in the game that I can’t imagine starting over from scratch. The other thing is that the game leans heavily on colors in both a functional and aesthetic sense. The developer has included a colorblind mode, but the game just isn’t as impressive when you’re playing in that style. You can always give it a try, but I’m not sure if I’d recommend Yankai’s Triangle with nearly as much zeal if you have issues with separating colors. At any rate, trying to explain Yankai’s Triangle in words is a somewhat futile gesture. It’s a fantastic puzzle game that I can’t recommend enough. You don’t have to worry about IAPs since there aren’t any, and the number of levels is mind-boggling. It’s relaxing, it teases the brain, and it’s dazzling in its presentation. And oh yes, it’s very weird, in perhaps the best possible way. Just go for it.